Christmas was approximately a week ago and I have not posted a 'What I Got For Christmas' post. I decided not to but I thought I'd shared with you the many Clinique products that I had received during this festive Christmas. For those who don't know much about Clinique, they are an allergy free and fragrance-tested brand who have products for all different skins ranging from normal to dry/combination. Luckily enough I was able to get quite a few products from Clinique this year as my Christmas presents. 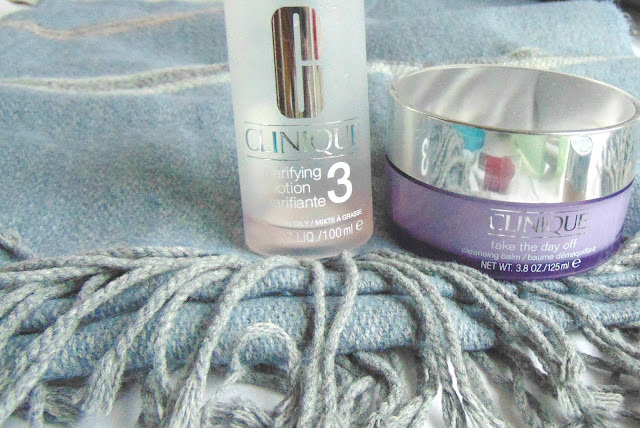 Before Christmas, I decided to purchase the Clinique 3-Step Intro Kit which inside includes a Clarifying Lotion, Moisturising Gel and Liquid Facial Soap. They were in small sizes, but up till now are still lasting apart from the Liquid Facial Soap. I then received on Christmas Day the full sized bottle of the Clinique Facial Soap. 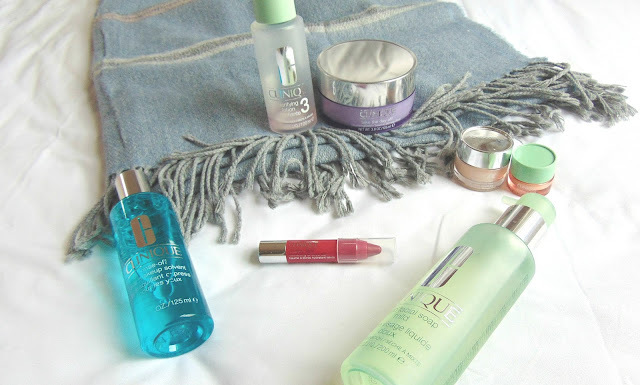 I then also received the Clinique Take The Day Off Balm which has been on my list for a while. There will be in-depth reviews coming your way shortly, but for my first impression I love the fact that this cleansing balm does not have a fragrance. It is gentle on the skin and turns milky once applied with water. To go with this, I also received the Clinique Take The Day Off Cleansing Cloths. I was very excited by these, I have used one of them obviously.They take off makeup extremely well, the combo is perfect together. Other than that, I also received the Clinique Eye Makeup Solvent. I have used this once, it was also very delicate around the eyes with a cotton pad. I also got the Clinique All About Eyes cream which I have been using for a while now, it is very light under the eyes and I am seeing an improvement. Also, I received the Clinique Moisture Surge which can be used as a moisturiser mask or just for everyday use. Last but not least, I got the Clinique Moisturising Lip Balm, I haven't used it yet but I am looking forward to it. That's it for my Clinique Christmas. Do you like Clinique? There are affiliate links above, for more information read my disclaimer. All the links above are from LookFantastic who are having a sale with a lot of the Clinique products for a cheaper price.